Ogletown Resilience: No stopping the Chestnut Hill "Preserve"
Well folks, it is DEFINITELY over now and virtually the entire open space (and 1/3 the woods and wetlands) will be packed with apartments, townhomes, and McMansion homes -- probably by year's end (if not sooner). We were clinging to life, hoping that Stranahan's Adverse Possession claim would complicate things, given that 2 points of access (one bi-directional) were required. It turns out that a min. 300 home development is where that regulation kicks in. Therefore, even if they don't connect to Waverly in Breezewwod, a simple eastbound IN/eastbound OUT on Rt.4 satisfies NCC Unified Development Code (UDC). 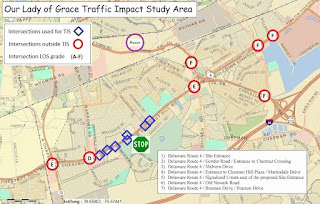 We were hoping that, with "Tree of Heaven Way" removed, it would force a new Traffic Impact Study given only one access point at Rt.4. For example, traffic entering/exiting westbound will now have to use U-Turns at intersections or median cut-throughs. This will only complicate already failed Levels of Service (LOS) that now cause massive backups on Rt.4. NCC has no issue with any of this, apparently -- not even that it could delay the arrival of civil services, i.e. paramedics. 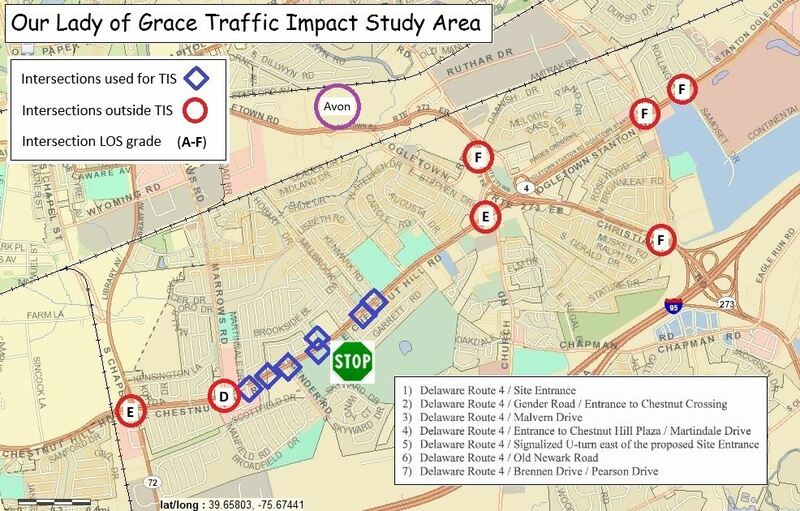 DelDOT still must weigh in, and provide for optimal through-movements. But by the time they get involved, even if they don't approve of such a limited access configuration, the project will have advanced to a point where there is no turning back. This was the argument we were trying to convince Vic Singer, who still thinks he can stop the Chestnut Hill "Preserve" at the 51st building permit. 51 dwelling units (DUs) is all the Unified Development Code allows dispensation for, when LOS is in failure mode -- as it most definitely is along Rt.4 and at its intersections. This was another issue we attempted to bring to the Ethics Commission, against Richard Hall, which has been all but dismissed at this point. As we see it, IF DelDOT weighs in, and as a result of a single one-way access point, upgrades to Rt.4 infrastructure is required, the next question is who pays for it? We have little doubt that we, the taxpayer, will have to foot the bill (never mind Meyer's tax increase), to ensure that Mr Sipple and friends can draw maximum profits. We're all going to pay -- bigly -- in any case; it's the Delaware way. In closing, nothing can now stand in the way of the full development; not DelDOT, not Vic Singer; not our State Legislators either, who could have easily stopped this over the 6 years they knew about it. In a brilliant counter move, Bob Sipple made sure to modify the building order to ensure that all key infrastructure elements (streets, sewer, drainage, etc) were already in place before any such conflicts arrived. Now, there really is no turning back.